I think I can safely say that this is my final winter ensemble for the season. Thank goodness, because I am ready for spring. And I am sure I am not alone. 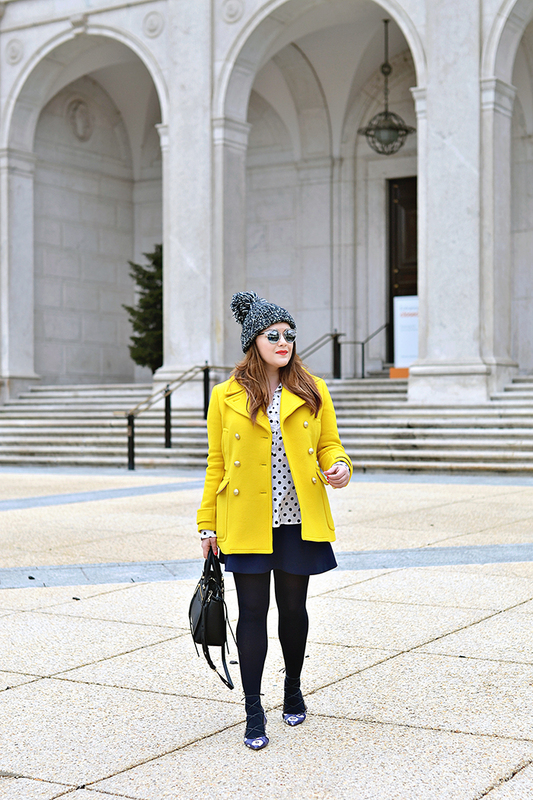 I love this yellow coat and it certainly brightens up any winter look, but, I am ready to replace yellow wool for my navy gingham-lined trench. Speaking of gingham, have you seen J.Crew's latest arrivals? It's a gingham palooza! I am trying not to go crazy, because nobody needs that much gingham in their lives. Hopefully, I can keep my touches of gingham strategic... we will see how long that lasts lol. I have to give credit to these lace-up flats. Not only did they work with tights (hello, year-round versatility), but they are surprisingly comfortable. I wore them all day in DC and clocked some 10 miles with zero discomfort or blisters. You know how much I appreciate a comfortable shoe, I may to invest in another pair down the road.